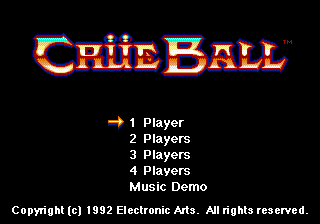 Crüe Ball (クルーボール), labelled Crüe Ball: Heavy Metal Pinball on the North American and European packaging, is a pinball video game developed by NuFX and published by Electronic Arts for the Sega Mega Drive in 1992.
flips the left flipper, flips the right flipper, and + + tilts. The goal of each table is to activate a ramp on the table which will shoot the ball to a bonus round and then to the next table. In the bonus rounds, the player is in control of a portable flipper: the D-pad moves around, , , and flip the flippers, and skeletons must be hit with three bonus balls. Crüe Ball was originally called Twisted Flipper, though changed its name after picking up an endorsement from Mötley Crüe. Despite the inclusion of Mötley Crüe records in the game, it was designed to sport a heavy metal look and feel from the beginning, with the level themes composed by EA's Brian Schmidt in-house. A prototype of Twisted Flipper has since been dumped. The game was seemingly set to be re-released in Europe in September 1996 as part of the EA Classics range, but it is not believed such a version made it to market. Main article: Crüe Ball/Magazine articles.